The course syllabus presents an innovative structure, stimulating continuous learning, with highly-qualified teachers linked to the three universities that jointly offer the degree, the Universitat Autònoma de Barcelona, the Universitat de Barcelona and the Universitat Pompeu Fabra, as well as to other major international academic institutions. The Master's in International Relations is offered in two different language options: the bilingual (Spanish-English) option, in which students follow approx. half the compulsory courses in each of the two languages, while they can choose from the whole range of electives in either in Spanish or English and the English-only option, in which all the compulsory courses are taught in English, including the pathway core courses. In this language track, students can also choose elective courses in Spanish, if they wish. The electives are offered to a large extent in English, however, some will only be available in Spanish. More detailed information about the courses can be found on the website. The Master's syllabus is made up of a combination of core subjects and a wide range of electives that reflect the students' individual interests. Building on knowledge acquired in the first semester, in the second semester students will take a pathway specialty and, in this way, build their education according to their individual interests within the different International Relations themes. 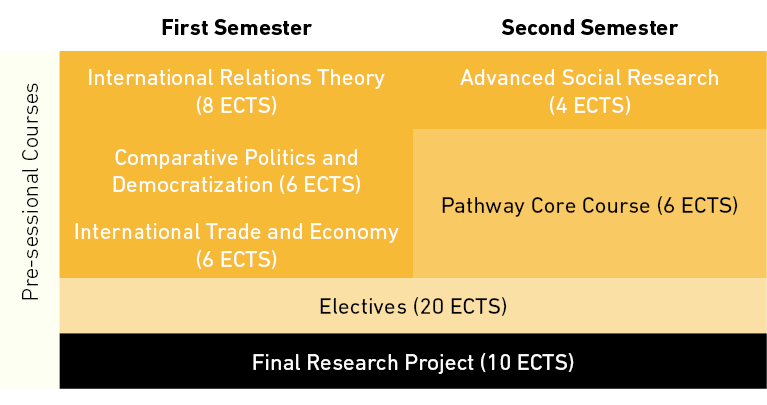 In addition, IBEI is introducing concentrations, suggested groups of four or five elective courses and a pathway course that combine to give a clear focus on one policy area or region. Students may choose how many of the electives to take, and may also choose freely from across all of the electives on offer. Throughout the year, IBEI offers both students and teaching staff a series of conferences and seminars carried out by high-profile international specialists as well as well-known professionals and politicians.